This auction is for a variety pack of Premium Quality Oxbow hays and treat. Oxbow Pet Products is a supplier of premium feeds for small exotic animals. Used and recommended by top exotic animal veterinarians worldwide, Oxbow offers an extensive line of superior quality, high-fiber hay and pellet products specifically formulated for chinchillas. 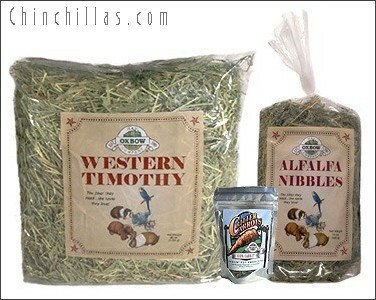 Western Timothy grass hay with high-fiber, low-protein and low-calcium content, helps keep the gastrointestinal tract of chinchillas functioning properly. Alfalfa is a high-fiber legume forage hay that is sometimes called the "Queen of Forages". Oxbow's Critter Carrots have the perfect combination of high fiber and low protein and are natures' perfect treat for healthy digestive systems. We are offering a 100% Satisfaction Guarantee on these products. If you are not 100% satisfied with this Oxbow product, return the unused portion within 30 days for a full refund (shipping excluded). To estimate your shipping charges add the products to the e-store shopping cart, click the estimate shipping button in the right column. Enter your postal zip code and state then click the reload rates button.